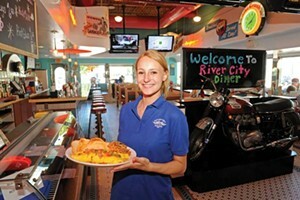 River City Diner (Bellegrade): Omelets bulging with cheese, seen-it-all (let me help you honey) waitresses and inexpensive checks. Flat-screen TVs to watch a game or pick up on what you missed the previous night after drinking a bit too hard. Karen’s Cafe: Fast, easy and familial. Joe’s Inn: Cheap and spicy hair-of-the dog bloodies, greasy, crispy shoestring fries and everyone else in your shoes. Ellwood Thompson’s Local Market: Don’t be surprised at who you see after a hard night’s work here. Its breakfast bar and vitamin B-12 goes a long way toward your return to normalcy.